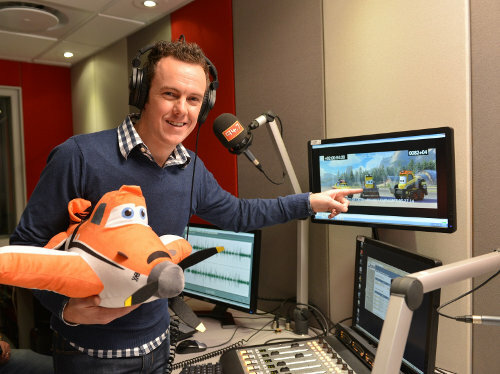 The Walt Disney Company Africa is proud to announce that local comedian and 947 presenter Darren Simpson, will lend his voice for the theatrical release of Disney’s upcoming animation Planes: Fire & Rescue, out in cinemas across South Africa in 3D on Friday 26 September. Darren will voice the character ‘Drip’, one of five firefighters called the ‘Smokejumpers’, a lively bunch of brave all-terrain vehicles who support a dynamic crew of elite firefighting aircraft devoted to protecting historic Piston Peak National Park from raging wildfire. ‘Drip’ is an ‘outgoing dude who’s always leaking oil and uses a skid-steer claw to clear fallen trees and brush’. ‘Voicing ‘Drip’, and featuring in a Disney movie is huge! It’s a dream project, I’ve had fun and enjoyed the whole process. I’m a big fan of Disney animations, and it’s a tight contest between me and my two-year old as to who’s more excited about watching the completed movie,’ said Darren. Planes: Fire & Rescue sees the return of world-famous air racer Dusty (voice of Dane Cook) who learns that his engine is damaged and he may never race again. Dusty realizes that he needs to shift gears and is launched into the world of aerial firefighting, joining forces with veteran fire-and-rescue helicopter Blade Ranger (voice of Ed Harris) and his courageous team, including spirited air tanker Dipper (voice of Julie Bowen), heavy-lift helicopter Windlifter (voice of Wes Studi), ex-military transport Cabbie (voice of Captain Dale Dye) and, of course, The Smokejumpers. Together, the fearless team battles a massive wildfire and Dusty learns what it takes to become a true hero. ‘We are thrilled to be able to bring Darren’s voice to the big screen in Planes: Fire & Rescue this September,’ says Christine Service, Senior Vice President, Country Manager for The Walt Disney Company Africa. ‘Darren brings that local flavor, together with a great mix of comedy and a very big heart that the character ‘Drip’ adds to the mix’. Tune into 947 in September to stand in line to win tickets to the South African Premiere of Planes: Fire & Rescue and exclusive movie merchandise. Catch Darren Simpson voicing the Smokejumper ‘Drip’ in Disney’s Planes: Fire & Rescue, in cinemas nationwide in 3D from Friday 26 September 2014.